The cloud-focused accounting and tax software company enjoys a much better quarter than this time last year. We zero in on key points from its report released on Thursday. Go ahead, file your taxes on your mobile phone. Intuit wants you to know it's got you covered. Image source: Intuit.com. Consumers might not like doing taxes, but they love Intuit's (NASDAQ:INTU) TurboTax software. Management cited a 12% increase in TurboTax online unit growth as a primary factor behind the company's healthy fiscal Q2 2016 earnings release on Thursday. Below, we run through major highlights of Intuit's earnings report. Intuit reported a 23% increase in revenue to $923 million, which exceeded the company's projected range of $880 million to $900 million. As expected, the software giant reported a profit, booking net income of $24 million. This hit the high end of management's guidance of between $15 million-$25 million and compared quite favorably to last year's $66 million loss. 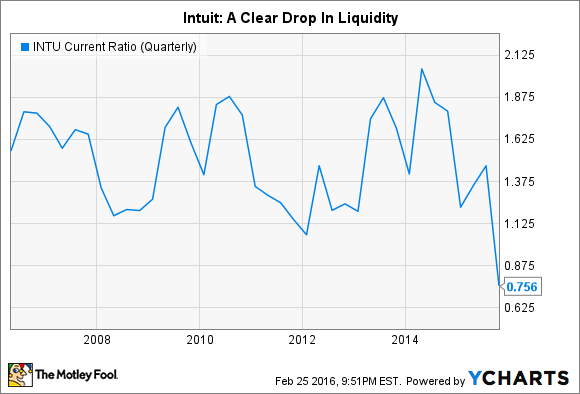 Intuit achieved diluted earnings per share of $0.09, versus a loss of $0.23 in 2015. The 12% rise in TurboTax online unit growth bodes well for the rest of the 2016 tax season, which makes up the bulk of Intuit's revenue in the next business quarter. The metric cited by management is actually a year-to-date comparison, through Feb. 20, against the same period last year. Including software physically installed on desktops, total TurboTax units during this period exceeded the prior year by a still vigorous 9%. Subscriptions for the company's flagship cloud accounting program, QuickBooks Online, or QBO, also exhibited crisp growth during the second quarter. In my earnings preview, I discussed that it would be difficult for QBO to maintain the torrid subscription growth rate of 57% recorded both last year and last quarter, and that shareholders should prepare for a drop-off from the 50%-plus expansion range. This quite literally happened in Q2, as QBO subscriptions grew by 49% over the prior year. Similarly, the growth rate of non-U.S. QBO subscriptions is yielding to the inevitable tug of gravity. This rate declined from 109% last quarter to 80%. It's important to keep these numbers in context. While QBO's market penetration is decelerating, it's still enjoying widespread and quite rapid adoption. The company closed the quarter with 1.26 million total QBO subscribers, with non-U.S. subscribers now exceeding one-tenth of this number, at 230,000 paying subscribers. In addition, users of the company's newest cloud subscription offering, "QuickBooks Self-Employed," swelled more than 42%, from 35,000 to 50,000 subscribers. In Thursday's earnings release, management announced a dividend payment for its fiscal third quarter of $0.30 per share -- a 20% increase over the comparable prior year quarter. Management also disclosed that Intuit repurchased $455 million of its own shares in Q2 2016, leaving $900 million remaining on the current authorization. The shares were repurchased at an average price of $95.22. This, of course, comes on the heels of Q1 2016's enormous share buyback in the amount of $1.3 billion. As strong as Intuit's cash flow may be, the company isn't paying for its significant share repurchases and dividends through an excess of operating cash flow. It has taken on a fair amount of debt as of late. For example, the total of current and non-current debt on Intuit's books has grown by 2.5 times, to $1.25 billion, in just the last six months. And that's just what shows on the balance sheet as of Jan. 31, 2016. In my earnings preview, I mentioned that Intuit reworked its credit facilities on Feb. 1, 2016, replacing a credit line of $500 million with a new facility with an aggregate borrowing capacity of $1.5 billion. In Thursday's earnings filing, the company disclosed that it also borrowed $250 million against the new facility on Feb. 1, a day after the close of the reported earnings period. Of course, management may merely have tapped the new credit lines to refinance other short- or long-term debt. The larger point is that Intuit's capital strategy has changed markedly over the course of a year. Not only has it substantially ramped up borrowings, but it's stretching working capital as a means to provide short-term financing. The company's current ratio, which measures the amount of current assets on hand to meet current obligations, has declined substantially since July, from a very healthy ratio of 1.5, to roughly 0.75. Intuit posted strong numbers on Thursday, and returned to second-quarter profitability, which it had missed over the last two years. So while shareholders should rightfully praise the way the profit and loss statement is being managed, it would be remiss not to point out that the company's balance sheet has weakened considerably. Intuit's aggressive schedule of share repurchases may have helped support its stock price in the last year, and the practice does increase earnings per share for each and every investor. But the pace of buybacks may soon slow, so that the company can at the least replenish its resources, and return to a more Intuit-like balance sheet. And there's no need to rush this recapturing of shares on the open market -- the current repurchase authorization granted by the board of directors doesn't expire until 2019.